Castle of Illusion Starring Mickey Mouse is probably the big release this week, especially for gamers like myself who absolutely loved the original Sega Genesis version back in the day. Kickbeat and Brothers: A Tale of Two Sons are surely worth checking out as well, and Arc System Works kind of snuck out a new 2D fighter called Chaos Code too. As for full PS3 game downloads, there’s Diablo III, DoA 5 Ultimate, Rayman Legends and more! So a lot of games competing for your PlayStation Store dollars. 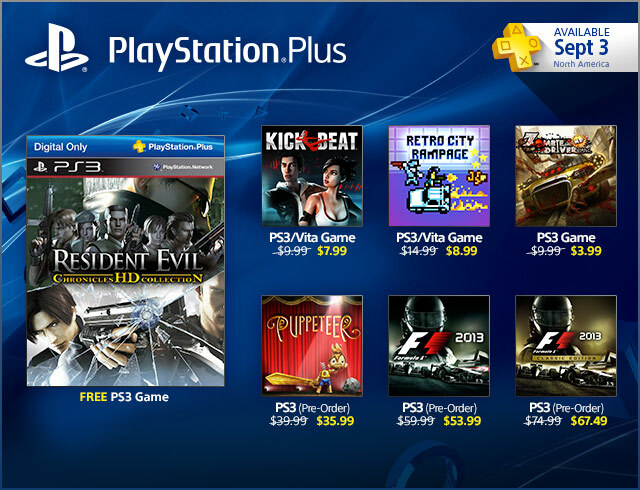 If you’re a PS Plus member, you’ll get Resident Evil Chronicles HD Collection for free beginning today. It is 1715. Pirates rule the Caribbean and have established a lawless pirate republic. Among these outlaws is a fearsome young captain named Edward Kenway. His exploits earn the respect of pirate legends like Blackbeard, but draw him into an ancient war that may destroy everything the pirates have built. Preorder and get the Exclusive Aveline Figurehead and Theme. With Gold you also get the Season Pass included. Batman: Arkham Origins features an expanded Gotham City and introduces an original prequel storyline set several years before the events of Batman: Arkham Asylum and Batman: Arkham City, the first two critically acclaimed games of the franchise. Taking place before the rise of Gotham City’s most dangerous criminals, the game showcases a young, unrefined Batman as he faces the defining moment of his early career and sets his path to becoming the Dark Knight. Preorder and get the Exclusive Theme. Make history in FORMULA ONE! Experience all-new 1980s classic content plus all the cars, stars and circuits from the 2013 FIA FORMULA ONE WORLD CHAMPIONSHIP in F1 2013. F1 2013 includes F1 Classics, an expansive new game mode introduced by legendary broadcaster Murray Walker, where you’ll race famous cars from Ferrari, Williams and Lotus against icons of the sports including Nigel Mansell, Mario Andretti and Gerhard Berger. Classic content also includes two historic circuits – Brands Hatch and Circuito de Jerez – and can be played in a range of modes including split-screen and online multiplayer. Make history in FORMULA ONE! F1 2013: CLASSIC EDITION is a premium package which expands F1 2013 with additional 1990s content featuring 6 cars and famous drivers, including Jacques Villeneuve, Eddie Irvine and David Coulthard, plus additional Classic Tracks – Estoril and Imola. LEGO Marvel Super Heroes features an original story crossing the entire Marvel Universe. Players take control of Iron Man, Spider-Man, the Hulk, Captain America, Wolverine and many more Marvel characters as they unite to stop Loki and a host of other Marvel villains from assembling a super-weapon capable of destroying the world. NBA 2K13 was a monstrous release for the world’s 1 NBA video game franchise, with more than 38 Sports Game of the Year and ‘Best Of’ mentions. NBA 2K14 will raise the bar yet again, providing the best basketball gaming experience for legions of sports fans and gamers around the world. Preorder and get the King James Pack and Exclusive Theme. One dark moonlit night, a young boy named Kutaro was carried away by the maleficent Moon Bear King to a black castle where the unlucky lad was transformed into a puppet. Kutaro displeased the terrible tyrant, who devoured the boy’s wooden head and cast away his body. But the headless hero was not alone, for he had discovered a very special pair of scissors to help him on his harrowing adventure to find his head, and his way home. Preoder and get the Exclusive Theme. Hacking is your weapon. Control the city of Chicago. Become Aiden Pearce, a brilliant hacker but also a former thug, whose criminal past lead to a violent family tragedy. While on the hunt for those responsible, you will be able to tap into the city’s omnipresent security cameras, download personal information to locate a target, control systems such as traffic lights and the electrical grid to stop a chase, and more. Now the city of Chicago has become your ultimate weapon to exact your own style of revenge. Preorder and get the Exclusive R33B Gun and Theme. FINALLY. 2K Sports’ lineup of premier simulation titles expands with the company’s first release in the flagship WWE videogame franchise, WWE 2K14. The most electrifying, authentic and comprehensive WWE video game experience to date has arrived. Become Immortal. Mickey Mouse returns to star in Castle of Illusion, a fantastical re-imagining of the Sega Genesis classic. With all-new HD graphics and gameplay, Castle of Illusion brings Mickey and his world to life in this magical Disney adventure! When the evil witch Mizrabel kidnaps Minnie, it’s up to Mickey to brave the dangers of the Castle of Illusion to rescue Minnie. Gather your courage and traverse enchanted forests, take on hordes of rebellious toys and navigate mazes of living books. Play as Mickey and save Minnie from Mizrabel’s evil clutches! Twenty years have passed since the Prime Evils were defeated and banished from the world of Sanctuary. Now, you must return to where it all began—the town of Tristram—and investigate rumors of a fallen star, for this is an omen that the End Times have begun. The Glade of Dreams is in trouble once again! During a 100-year nap, the nightmares multiplied and spread, creating new monsters even more terrifying than before! These creatures are the stuff of legend… Dragons, giant toads, sea monsters, and even evil luchadores. With the help of Murfy, Rayman and Globox awake and must now help fight these nightmares and save the Teensies! Dead or Alive 5 Ultimate brings fighting entertainment to the next level with all-new modes, characters, stages, and more! Several new playable characters enter the fight, including Momiji and Rachel from the Ninja Gaiden series and Jacky from the Virtua Fighter series. Tons of new modes and features have been introduced, including Team Fight and multiplayer tag modes. The best in fighting entertainment has just gotten even better! Share in the epic journey of two brothers, as they set out to find a cure for their dying father. Travel across beautiful vistas, through dark and foreboding forests, down perilous rivers, up hazardous mountain sides and experience the wonders of Nordic mythology along the way. Use the unique control system to control each brother with a thumb stick, for concurrent gameplay throughout the adventure. Use both brothers cooperatively to solve puzzles, explore the environments and in boss encounters. This is one journey you will never forget! High speed new style 2D fighting game ‘CHAOS CODE’ is finally here on PlayStation 3 system! Otaku fighter ‘HIKARU’, mysterious gothic girl ‘CELIA’, italian chinese chef ‘BRAVO’ and many more unique characters are waiting for you to join the battle! Create your own style with ‘SKILL SELECT SYSTEM’ and reveal the truth behind ‘CHAOS CODE’ before your rivals! After two years of training and gaining new skills, the Straw Hat Crew is back and better than ever as Luffy continues his quest to become the Pirate King! Luffy and his crew will appear with their New World outfits and all new attacks to take down hordes of Pirates and Marines that will flood the screen. Immerse yourself by playing the “New World” with your favorite characters and their latest techniques and costumes. Brown bear, elk, coyote… track 25 different prey in this hunting simulation set in the most beautiful countryside of the USA. Track wildlife through 30 hunting plans and unlock new skills, weapons, and outfits for your hunter. Set off on a hunting weekend and freely explore the region of your choice: Kentucky marshland, Colorado plains, Alaska mountains, Wyoming lakes, Alberta forest. Play as your dog during tracking phases, approach your prey without being detected, and shoot at the ideal time. Train on your own or with a friend at the shooting range: ball-trap, duck shooting, fixed or moving targets. Aim accurately and get the top score! Beat matching meets kung fu in KickBeat, an award-winning rhythm game where rhythm and action merge seamlessly. It features licensed tracks from a diverse lineup of artists, from well known bands such as Pendulum and P.O.D, to indie pioneers Celldweller and Blue Stahli, to hidden talents like electronic music producer Voicians and Taiwanese rapper Shen Yi. Join with your friends over local ad hoc or Wi-Fi networks to take on each of the 90 total levels in co-op. Share your achievements and stats over Facebook or challenge your friends to top honors in one of the unlimited daily and weekly challenges found in our competitive multiplayer. Whether alone or with friends, Rayman Legends on PlayStation Vita system rocks on the go! Solum is being destroyed by a mist. Young Spero must recruit allies, defeat enemies, and open the Gate of Eternity to save the world. Atelier Meruru arrives on PlayStation Vita system with additional elements! Get the exclusive costume and accessory in one pack with this game & DLC bundle! ‘Mushroom Princess Swimsuit’ and ‘Small Straw Hat’ are included in this package. This bundle is a limited time offer until 09/30/2013. Gaiam TV launches today on the PlayStation Store. It is a streaming media service that provides unlimited opportunities for transformation. From energizing yoga classes to inspiring documentaries and cutting-edge programs, Gaiam TV takes you beyond the boundaries of mainstream media to reveal new perspectives for our changing world. Sign up for a free trial here.